Cut or tear baked French loaf into 1/2-inch cubes. In ungreased 3-quart baking dish, combine bread cubes and chocolate chips. Set aside. In medium bowl, beat milk and eggs with whisk until combined. Pour over bread mixture in baking dish. Cover with plastic wrap; refrigerate at least 2 hours. For best results, refrigerate overnight. When ready to bake, heat oven to 350°F. Uncover baking dish. Sprinkle cereal evenly over top. Bake 50 minutes. With kitchen scissors, cut marshmallows in half. Without turning oven off, remove baking dish from oven. 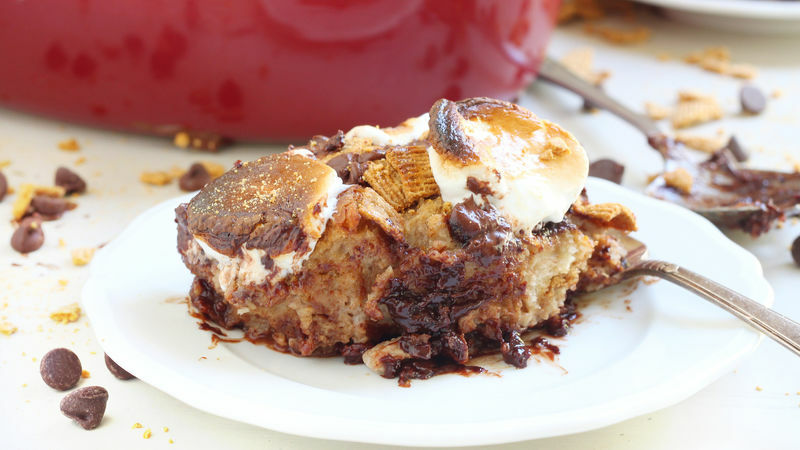 Top casserole with marshmallows. Return to oven; bake 2 to 3 minutes longer or until marshmallows are puffed and toasty. Watch carefully so marshmallows do not burn! Serve warm. Store in refrigerator. To make sure the casserole doesn’t turn out soggy, let the bread soak and absorb the liquid for at least 2 hours. Add the Golden Grahams™ cereal once all of the liquid is absorbed by the bread so the cereal stays crunchy after baking.